The Spring Bazaar is an annual event organized by the Ladies Auxiliary. The booths upstairs offer Polish crystal bowl and vases, amber and silver jewelry, pottery, crafts, books, Easter eggs and much more. Downstairs you can enjoy traditional Polish dishes served by the young waiters clad in Polish folk costumes. You can also buy home-made desserts and pastries. Also, Polish Choir Vivat Musica! will sing at 2:30 pm. Organized by Ladies Auxiliary. Volunteers needed: 1) Making pierogi for the bazaar, contact Irena Kulik (on Tuesdays at the Polish Home from Feb 17 to Mar 17), 2) setting up tables on the day before, contact Alisa Lahti. The Polish Home Assn invites all members and friends of the Polish Home to participate in a cleaning party between 9 am and 2 pm - a delicious lunch will be provided! Volunteers typically help to clean up the parking lot, tend to garden beds around the building as well as clean and de-clutter the inside. If you can please come with your own tools and bring a van or light truck for debris removal. Everyone is invited. Where: at the Polish Cultural Center Dom Polski from 9 am to 2 pm but drop by when you can for as long as you can - every pair of hands helps! Free lunch served! The book for the meeting is Spiewaj ogrody by Pawel Huelle, published by Znak in 2014. Huelle, 50, is a renown contemporary writer and activist, known for his Gdansk roots since his famous debut and movie Who was David Weiser? Spiewaj ogrody is a reminiscing story about multiethnic world that used to exist in Gdansk and its echoes today. Lilian Szlaga Piano Studio presents a yearly piano recital celebrating music of Frederic Chopin. Ms. Szlaga will open the concert with Nocturn D Flat op. 27 no 2. The program includes mazurkas, nocturnes, preludes, waltzes and polonaises by Chopin performed by the Studio students from 9 to 17 years old. The Polish Home restaurant is open from 1 to 4 pm. Human Identity is an "inventive, funny and eye-opening" one man show by the Los Angeles-based writer and performer Christopher Vened Szwaja. Mr. Vened is an actor trained in the famous Henryk Tomaszewski Pantomime Theatre in Wroclaw, Poland, where he played many leading roles. In this monodrama Mr. Vened combines words and physical action to ponder on what it means to be human. Alisa Lahti invites again to her very popular workshops. Pisanki is a very old art of egg painting, where hot wax is drawn on an egg to create intricate patterns, the egg is then dyed in wonderfully vibrant colors. Come to learn this technique and take home some of your own beautiful Easter eggs! All materials provided. Where: at the artist's studio on March 7 & 21 at 10 am to 2 pm; $30 per person. Class size is limited to 6 people, so make your reservations early. More: About 2015 workshops For reservations on any of these please contact Alisa Lahti. The Polish Choir Vivat Musica! from Seattle will give a concert at the Ethnic Celebration in Lacey, WA. This family oriented event includes performances at 3 different stages by many different ethnic group ensembles as well as the usual booths with arts and crafts, ethnic food, vendors and children activities. The event runs from 10 am to 6 pm. Where: at St. Martin's University in Lacey, WA; admission free. 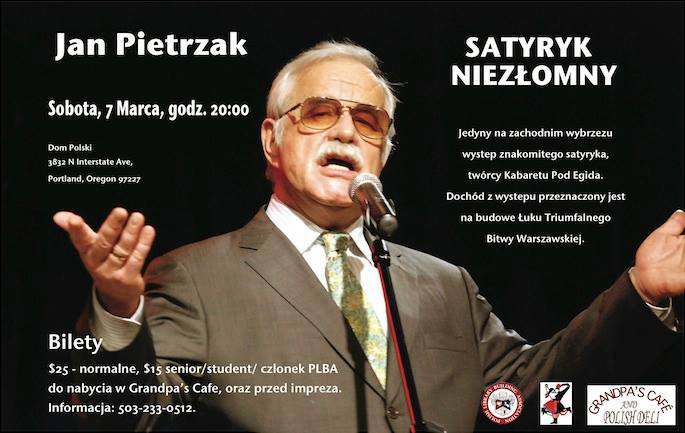 The Polish Hall in Portland presents the veteran cabaret actor and one of the best standup comedians, Jan Pietrzak in his program Satyryk niezlomny. Mr. Pietrzak, who founded the famous Kabaret pod Egida in Warsaw, comes to Portland during his west coast tour. The profit from this performance goes towards the Arch of Triumph for the Battle of Warsaw (1920). This program is in Polish. Polish Home Association presents a documentary film The Art of Chopin (52 min) by Gerard Caillat with introduction by Dr. Steven Lagerberg, a founder and a long time president of the Chopin Foundation NW. The movie made as a tribute to Chopin's 200th birthday includes performances by several great pianists, including Arthur Rubinstein, Piotr Anderszewski, Svatoslav Richter and Garrick Ohlsson. This event is in the series Meetings with Polish Culture organized by Beata Gallaher and Monika Johnson. UW Polish Studies Endowment Committee presents an exhibit The World Knew: Jan Karski's Mission For Humanity. Jan Karski was a WWII hero, an underground courier for the Polish government who risked his life to bring first eyewitness reports about Nazis' exterminations of the Jews to the Allies, including President Roosevelt. He is recognized as a man who tried to stop Holocaust. Exhibition created by Polish History Museum in Warsaw and J. Karski Educational Foundation. Volunteers are needed to dismantle the exhibit at 1 pm on Sunday, March 15. Where: Exhibition at North Lobby, Allen Library at the UW campus in Seattle, admission free; the exhibit is available during the library business hours till 1 pm March 15, 2015.